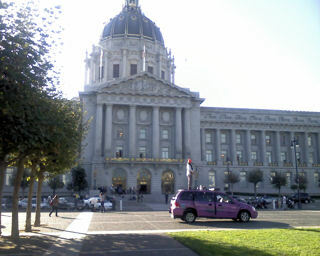 I was just over at city hall taking care of some business. When I came out onto the steps, I smelled pot (not uncommon in San Francisco), and heard a guitar playing (a little less common…) I scanned the steps, then peered across the street, and there I spied a pink van with a guy on top playing his electric guitar and singing. Huh? Apologies for the crap picture from my cell phone camera, but It turned out to be… Grasshopper for Mayor! See my earlier post about our mayoral candidates. Or this San Francisco Chronicle article about them. ← What does a 5.6 earthquake look like?